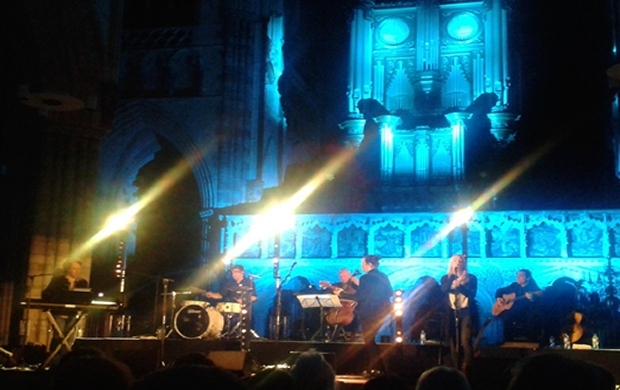 There has been a sacred building on the site of Exeter Cathedral since at least Roman times and this beautiful medieval cathedral was a perfect venue for the spiritually uplifting and emotionally drenched music of Anathema . 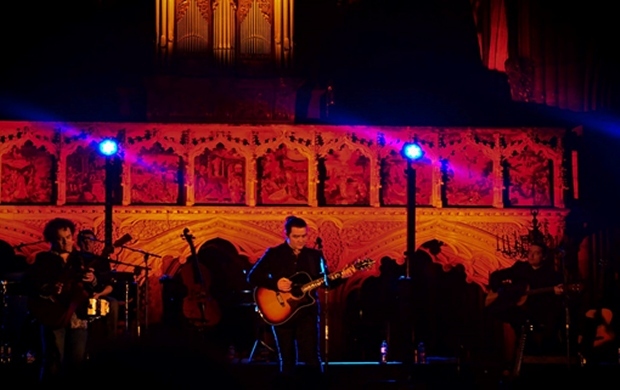 They have embarked on a short tour of some of the most historic cathedrals in the UK on an acoustic tour, in which they have stripped down from their usual full-on rock sound. 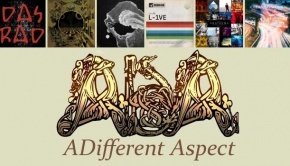 The transformation of this previously doom metal band into artists able to sensitively engage it’s audience with soulful rock music imbued with a balance of delicacy and power has been utterly remarkable over the last few years, and shows true progression. The vast arches and vaulted ceilings of cathedrals were designed to add an angelic resonance to the choral music of worship, and Anathema skilfully used these acoustic qualities for their own particular brand of spiritually infused music. The evening began with a short set of impressive violin music from Anna Phoebe, with Nichola Rizzi on acoustic guitar. Between them they were able to evoke a range of atmospheres and feelings which helped put the audience in the right mood for the main event. 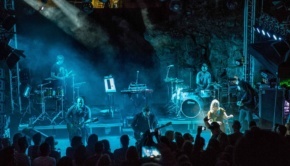 There is real power in such restraint, and the audience were completely captivated by one of the best songs in the Anathema canon. 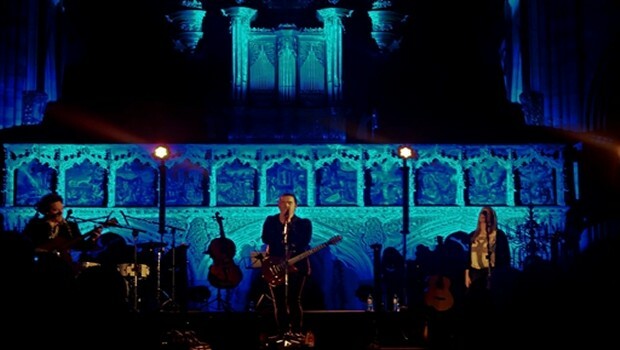 Similarly two of the best songs from We’re Here Because We’re Here consolidated the outstanding early quality of this performance with the contrasting power of Thin Air and the shimmering radiance of Dreaming Light, perfectly complimented by the subtle and atmospheric lighting of the band amidst the shadows of the magnificent gothic architecture. The band were joined for the next two songs from Distant Satellites by Dave Wesley on cello, with band siblings Jamie Cavanagh on additional guitar and John Douglas on drums. 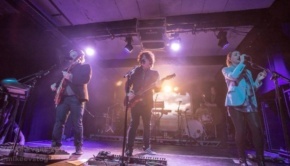 ‘Prog’ magazine voted the song Anathema as ‘Anthem of the Year’ in 2014, and along with Ariel the addition of these extra instrumentalists added a more diverse backdrop and musical colour to these songs. Danny Cavanagh, with his heavy musical load, used his warm wit to excuse his occasional lapses, but as his brother Vincent said ‘This is live music’. However, he did have to remind Danny that they were in a church when he used one profanity for which he apologized, but the audience were willing to forgive him virtually anything such was his charm and excellence. Possibly the most disappointing song of the evening was Electricity, which ironically lacked a little spark, with Danny on vocals. The lilting Temporary Peace, from A Fine Day to Exit, restored the vocal duties to the sublime Vincent and Lee Douglas on one of the first songs she ever recorded with the band. The main set finished with the band walking off to Take Shelter as the loop effects set up by Danny continued to echo around the longest gothic vaulted ceiling in the world, and the crowd were all on their feet applauding such a great concert. 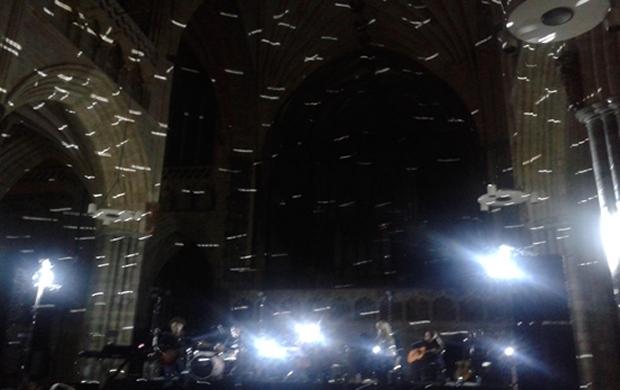 The ethereal Internal Landscapes about the spiritual feelings associated with near death experiences seemed an apt song to play within such a setting in the encore, as the crowd was asked to light up the cathedral with their camera phones. This was followed by the undoubted highlight of the evening as Lee Douglas serenely sang A Natural Disaster and the whole cathedral was magically lit up with a thousand points of light bouncing off dual mirror balls spinning around the hallowed arches and altars of this ancient place of worship. For such a simple effect it was a truly breathtaking moment. There are risks in performing acoustically as it may reveal a lack of musicality without the fig leaf of major amplification, or it may reduce once powerful songs into pale insipid versions of the original songs. 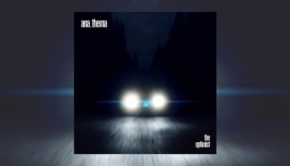 Anathema skilfully avoid such pitfalls and intelligently use the acoustic approach to further bring out the lyricism, emotion and melody that they have continually developed in their career. There are only a few concerts in life that truly burn themselves into your memory and touch your soul, and this was achieved for many in that sacred and spiritual setting by this special band.